LetsGoDigital: The Canon IXUS line is very well thought out, and the years of success that have preceded this model will undoubtedly be continued by the Canon IXUS 60. One wonders just how long Canon will manage to keep this up, but at this time the IXUS is still proving extremely profitable for Canon. The camera meets all expectations. 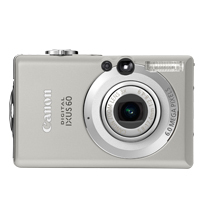 The Canon Digital IXUS 60 is of a compact size, has been neatly and attractively finished and has an excellent image quality. The possibilities and options offered are extensive, and might prove for some users to be the start of a more active interest in the creative side of the world of digital photography. 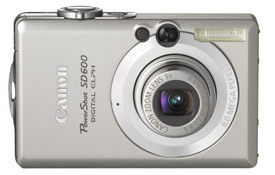 The Canon IXUS 60 is a trendy digital camera, but also one that keeps a keen eye on quality. PopPhoto (link dead) reviews Canon PowerShot SD600 Digital ELPH and concludes that lightweight and feature packed, the fashionable Canon PowerShot SD600 Digital ELPH can easily slip into a pocket or purse, making it the perfect on-the-go digital camera. It offers a nice combination of features and performance in a stylish, portable package. If you are looking for an ultra-compact camera that captures great images to take with you anywhere you may roam, this is it.